Being able to listen to any music, podcasts, or other streamable content out there at high quality will make any day more manageable. There are an endless number of high quality headphones at an affordable price on the market, however, there are plenty of people looking to cut as many cords out of their lives as they can. While Bluetooth headphones may seem like the only option for wireless audio, we took a look at every type of wireless headphones out there in order to bring you the most complete list possible. We took a look at the best wireless headphones available on the market that stay affordable while still providing an incredible wireless experience. We started our search for the headphones on this list by narrowing the field to wireless headphones of all types. From there, we focused in on headphones under $100. We paid attention to headphones from reputable brands in order to guarantee good quality. We’ve looked over dozens of wireless headphones that are all sure to provide a premium experience deserving of your hard-earned money. We determined this final list by pouring over technical specifications and user reviews from all over the web as well as considering which features deserved the most attention. We compared every nuance of these headphones and weighed each category in order to bring you the five best wireless headphones under $100. The most important feature in any pair of headphones is the sound quality. Flashy aesthetics and cool features simply can’t make up for a lack of sound quality in your headphones. A good pair of headphones will give you great playback quality you’ll listen to for hours on end. We made sure to take a look at and include the different sound technologies in each of these headphones. We looked over headphone driver sizes, the audio range of each driver, and the underlying technologies in order to bring you the most complete list possible. We put sound quality as our number one priority, because even wireless headphones can still provide quality sound. We made sure to look at great sound quality at an affordable price. While all the headphones featured on this list are wireless in nature, not all wireless headphones feature the same technology or connectivity. Instead of focusing solely on bluetooth headphones for this list we decided to expand our criteria to include headphones that use various types of wireless technology. Wireless base stations, bluetooth connections, and other types of wireless technology can all be found in headphones, and we were sure to weigh the advantages and disadvantages of each when compiling this list. We went ahead and included the type of wireless technology used in each pair of headphones in our review so that you can make an informed decision. The design of your headphones will be the first thing anyone notices about your headphones. Wireless headphones are especially known for great design choices. A good pair of headphones will sport a good design that is worthy of being used alongside your multi hundred-dollar smartphone, tablet, or laptop. However, aesthetics wasn’t the most important part of our design criteria. A good pair of headphones will be well built and won’t give out after just a few months of using them. We prioritized headphones with high quality construction so that you can be sure that your headphones will be around for a while. Comfort is also incredibly important to the design of your headphones. With a good pair of headphones, you won’t have to repeatedly take them off due to discomfort. Controls on the headphone cable of standard headphones have become a staple of headphone design. Even though Wireless headphones lack a cable, many still come with some form of controls on the headphones. Play and pause buttons are great, but we gave extra points to headphones that have more controls, and even more points to any headphones that presented their controls in a unique and innovative way. Realizing you forgot to charge your electronic device is never a pleasant experience, and when you throw your headphones on the last thing you want to realize is that the battery has run out. Battery life is incredibly important to wireless headphones, and we gave extra points depending on the battery life of each pair of headphones when putting our list together. They type of battery in each pair of headphones was also something we paid attention to. We paid attention especially to headphones that feature removable and swappable batteries for ease of use. However, many people may prioritize price or other features over battery life. We were sure to include headphones that have the option of using them as wireless headphones if the need arises. Our number one pick for best wireless headphones under $100 was the Sennheiser RS120, which provide top notch sound quality and great features at an aggressively affordable price. Starting with sound quality, the Sennheisers excelled our expectations when it came to sound. The open back design gives strong bass response and warm sound. These headphones are perfect for hi fi response that’s not limited to music, but are perfect for everything from gaming to watching TV. These headphones promise good clarity and bass response for one of the best prices out there. 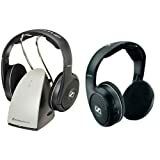 Unlike Bluetooth headphones, these Sennheisers use a transmitter base that can be connected to any analog input, including tv’s, computers, and sound systems. While the base station makes them less portable than Bluetooth Headphones, the base features interference-free reception through walls, ceilings, and outdoors up to 300 feet. Our favorite feature of these headphones are they you can pair another pair of these headphones to the same base station for easy listening for multiple people. The design of the Sennheisers is one of our favorites. The open back design of the earcups give you incredibly clear sound. The lightweight design with padded headband is perfect for long listening sessions. Headphone controls on the ear cups give you easy access to several controls in an easily accessible way. Volume up and down, power, and tuning controls are located on the earcups. Another feature we loved on these headphones is the fact that they use removable and rechargeable AAA batteries that you can swap on the go, allowing you to extend your battery life indefinitely. Coming in second on this list is the top pick from our list of the best Bluetooth Headphones: the Sony MDRZX770BT. The sound quality of these Sony headphones is some of the best we’ve ever seen on Bluetooth headphones, as the dual 40mm drivers deliver accurate sound with a frequency response of 20-20,000 Hz. One of our favorite features in these headphones are the ability to use the included audio cable to extend the frequency to 8-22,000 Hz for even better sound quality when you don’t mind the wire. The padded headband and breathable ear cushions paired with the rotatable ear cups make for a very comfortable design that you’re sure to love wearing. The included battery life is a great 17 hours of continuous wireless playback. And the aforementioned audio cable allows you to extend the battery life indefinitely. As for controls, a button on the earcup allows you to take and end calls with a single button push. In addition to this, the earcups hold a power button and volume controls. These headphones quickly connect to your Bluetooth device using NFC technology for super-fast pairing. Third on our list are the Avantree Wireless Bluetooth Over Ear headphones. These headphones sport a great design and some really impressive technology under the hood. A big draw of these headphones is their promise of no audio delay for watching tv or gaming. These headphones promise superior hi-fi sound with built in bass boost that lets you tailor the audio to your preferences. These headphones use Bluetooth for easy connection on the go to almost any device you have. In addition to this, they can be used with a separate receiver for use with a conventional tv. We liked the design of these headphones, however inadequate padding in the headband leaves a bit to be desired. However, they are very light. These headphones also lack any on ear controls, landing them lower on the list than they could have been with on ear controls. The battery life on these, however, was the best we reviewed with an impressive 40 hours of battery life that is sure to get you through multiple listening sessions free of worry. 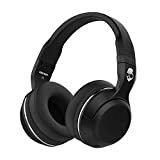 Coming in at number four on our list are the Skullcandy Hesh 2 Bluetooth headphones. The two powerful 50mm drivers provide refreshingly loud and clear playback. In addition to the Bluetooth connectivity, the Hesh headphones allow you to use a backup cable to extend your listening sessions. We love the simple black design of these headphones that provides a sleek and simplified aesthetic that is perfect for gaming setups. The noise isolating fit of the leather seal around the ear provides noise blocking, making them great for use in high noise areas like dorm rooms. An on-board remote/mic allows you to adjust volume, answer calls, and switch songs all on the earcup. Finally, the battery life on the Hesh headphones is good, but not great as they sport a slightly higher than average 15 hours of playback, but lack a removable battery. These headphones are perfect for anyone looking for a sleek design with great sound quality at an affordable price. Rounding out our list are the Sony MDRZX220B wireless on ear headphones. While they may not be as powerful as the other Sony headphones we reviewed, they pack great features into a small and streamlined package. The 30mm drivers are the smallest we reviewed, and as a result the sound quality in these headphones won’t hold up to other wireless headphones we reviewed, however at this form factor that’s to be expected. 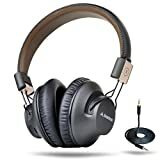 These headphones are great for anyone looking for Bluetooth connectivity in a refined and sleek design that features a compact swiveling on ear design for comfort. While these headphones don’t have any on ear controls to control media, it does include the same one touch pairing seen on the other Sony headphones along with a microphone for hands free calling. The battery life on these headphones is a modest 8 hours. But, for the price and form factor we think these headphones are a great addition to our list. A good pair of headphones will change the way you experience your favorite content both on the go and at home. Those who are looking to cut cables out of their lives can turn to wireless headphones for ease of use and reliability. Our number one pick as the Sennheiser RS120 for its innovative base station, impressive sound and build quality, and top notch features. And it packs all of this into a very affordable package. However, every one of the headphones we reviewed here bring something new to the table, and each are sure to let you leave wires behind while getting top sound quality. If you hate cables, then you should consider our list of the Best Wireless Headphones under $100 to find the best choice for your needs.